Are you suffering with pain from an injury or illness and nothing seems to provide you with any relief? Or maybe you would rather not take medicine or prescription drugs, and instead prefer a natural approach to healing? You are not alone. 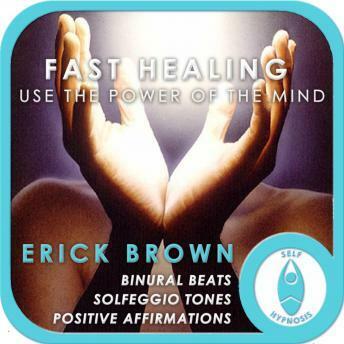 Learn how to use your mind's power to speed your healing process with this hypnosis program from Erick Brown Hypnosis. Let "Fast Healing: The Power of Your Mind" show you how to get natural pain relief by using the healing energy in your mind. The mind is one of our most powerful tools for healing and the positive mindset and the belief that you are a going to be healed will speed the process up. Powerful suggestions for deep relaxation and positive change will be received by your subconscious, increasing your confidence in the healing power of your mind. This healing belief will speed up your healing and relief from the pain of your illness or injury.